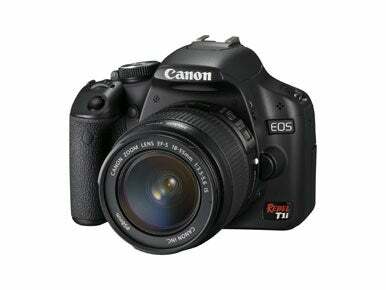 Canon on Wednesday introduced the EOS Rebel T1i digital SLR camera. Among its features, the T1i is the first in the Rebel line to include full HD video capture. The Rebel T1i features a 15.1 megapixel CMOS sensor, a 3.0-inch Clear View LCD (920,000 dots/VGA) monitor and functions like Auto Lighting Optimizer, Creative Auto Mode and Canon’s Live View modes. The Rebel offers continuous shooting at 3.4 fps for up to 170 large/fine JPEG images or up to nine RAW images in a single burst when using a class 6 or higher SD or SDHC memory card. The T1i provides ISO speeds from ISO 100 up to ISO 3200 in whole stop increments, along with two additional high-speed ISO settings – H1: 6400 and H2: 12800. The camera features 16:9 720p HD video capture at 30 fps as well as a full HD 1080p video capture at 20 fps, and a third option to record 4:3 standard TV quality (SD) video capture at 640 x 480 pixels and 30 fps. The Rebel will record video up to 4GB per clip equaling approximately 12 minutes of Full HD video, 18 minutes of 720p HD video, or 24 minutes of SD video. The Canon EOS Rebel T1i Digital SLR Camera will be available in early May and will cost $799 for the body only.